Deadly Towers is an adventure game co-developed by Lenar and Tamtex for Irem as a software title for the NES. It was released in Japan on December 15, 1986, and in the United States in September of the following year. 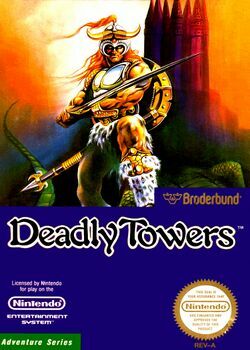 One of the earliest published titles for the NES in America, Deadly Towers proved to be markedly unpopular, largely due to the high learning curve and high difficulty level when starting the game, which involved entering different areas with no clear reason why, as the entrances are invisible. In Japan, Deadly Towers was titled Mashou (魔鐘), literally meaning "Evil Bell". It is a pun of the word mashou (魔性), meaning "devilishness." Fittingly, the original title outside the Japanese market was to have been "Hell's Bells," but according to the game's producer, Nintendo of America ordered the name changed. On the moonlit eve of his coronation ceremony, pensive Prince Myer sits at the lakeside to ponder the future of the kingdom. Suddenly, a shadowy kami called Khan rises from the lake and coalesces into the form of a man. Although he doesn't identify himself, the figure greets Prince Myer by name, and informs him that the wizard Rubas, the "Devil of Darkness", is preparing to overtake Willner Kingdom by using seven magic bells capable of summoning an army of monsters. To ensure peace, Prince Myer must travel to the northern mountain to burn the Seven Bells in the sacred flame; to burn down the seven bell towers in Rubas' magic palace; and, ultimately, to defeat Rubas himself. This page was last edited on 12 September 2018, at 02:41. This page has been accessed 21,038 times.